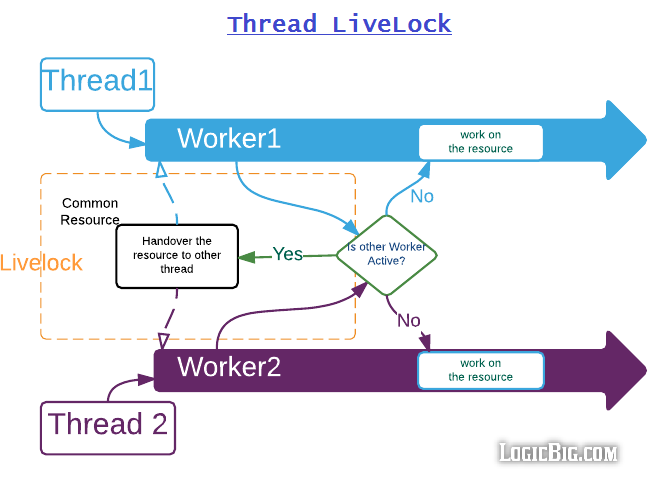 A livelock is a recursive situation where two or more threads would keep repeating a particular code logic. The intended logic is typically giving opportunity to the other threads to proceed in favor of 'this' thread. A thread often acts in response to the action of another thread. If the other thread's action is also a response to the action of another thread, then livelock may result. As with deadlock, livelocked threads are unable to make further progress. However, the threads are not blocked - they are simply too busy responding to each other to resume work. For example consider a situation where two threads want to access a shared common resource via a Worker object but when they see that other Worker (invoked on another thread) is also 'active', they attempt to hand over the resource to other worker and wait for it to finish. If initially we make both workers active they will suffer from livelock. // wait for the resource to become available. In above example we can fix the issue by processing the common resource sequentially rather than in different threads simultaneously. Just like deadlock, there's no general guideline to avoid livelock, but we have to be careful in scenarios where we change the state of common objects also being used by other threads, for example in above scenario. the Worker object.